Ten years after a collapse of the western economic system, Australia’s mineral resources have drawn the desperate and dangerous to its shores. With society in decline, the rule of law has disintegrated and life is cheap. Eric (Guy Pearce) is a cold and angry drifter who has left everything and everyone behind. When his car - his last possession - is stolen by a gang of desperate desert hustlers, Eric embarks on a ruthless mission to track them down. Along the way, he is forced into an unlikely relationship with Rey (Robert Pattinson), the naïve and injured younger brother of gang member Henry (Scoot McNairy) who has left Rey behind in the bloody aftermath of the gang's most recent robbery. The 'The Rover' competition has now closed. Winners will be announced shortly. Competition opens at 6pm AEDT on Sunday 12th October 2014 and closes at 11:59pm AEST on Sunday 19th October 2014. Five winners will be chosen at random on Monday 20th October 2014. To successfully win, entrants must fulfil the above entry conditions before the time the competition closes. Current members/followers are eligible to enter the competition. Only one entry per person. Only one winner per household. To be a valid winner, the entrant must not have won a prize from SWITCH within the last 28 days. Each winner will receive one Blu-ray copy of 'The Rover'. By entering, you agree to receive occasional emails from SWITCH in the future. If you decide to unsubscribe from these updates, any further entries will not be applicable. Only Australian residents are eligible to enter. 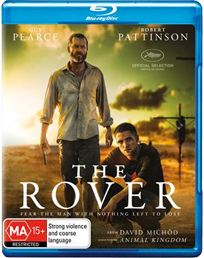 'The Rover' is available on Blu-ray, Digital and DVD on Wednesday the 15th October 2014 from Roadshow.